Elementary Bible Activity Lessons are the perfect solution whenever you need a Bible lesson or just some extra activities for Sunday school. Bible Clubs or children's church. You can choose lessons based on topic, Bible reference, or even Scripture verse. Each lesson is regularly only $5.95 each. Now the more lessons you buy, the more you save! Use BACT10 to save $1.00 off each lesson ($4.95 each) when you purchase 10 or more. Use BACT25 to save $2.00 off each lesson ($3.95 each) when you purchase 25 or more. Mention these coupon codes when you call 1-800-854-1531 or use these codes in the Coupon box when you check out online. Instantly download the lessons you need, any time, at your convenience online. 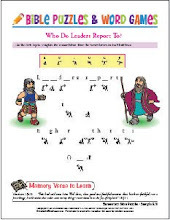 Each Bible story features three or more Bible activity sheets, one take-home Bible story page with activity, and a teacher's page with a creative way to present the Bible lesson plus answers to the activity pages. Many lessons also include colorful visuals to help tell the Bible story. Wonderful supplement to any Sunday school curriculum — and VBS too! Download or view the entire Scope & Sequence.